With innumerable temples in its lap, Karnataka is one of the most visited temple states in India. Few located atop hills, numerous on flourishing land and several in the dense forests and deep valleys, these temples in Karnataka contribute to a major part of tourism in the state. Did you know there are some temples which are hidden in the caves and under the slopes of hills in Karnataka? If you are one amongst those who just love to explore places irrespective of their location and physical conditions, then this article is for you. Why not visit these marvellous cave temples this season and explore their surroundings and unveil their hidden corners? One of the least-visited cave temples situated in the Hulimavu region of Bengaluru, Hulimavu Shiva Cave Temple is believed to be built during the 16th century. However, there is no strong evidence found to declare its origin and formation, this Shiva cave temple has been in the cave of a monumental single rock since last 500 years. The temple is dedicated to three deities with a Shivalingam settled in between the idols of a devi and Ganesha. It is also believed that this cave was once a meditation centre of the saint Sri Ramanand Swamiji, who spent his yogic life in the deep corners of this cave. Apparently, his samadhi is also found there. You can find his photo kept above the samadhi, where his body lies. Also Known as Gavi Gangadhareshwara Temple, this mysterious cave temple was built in the 16th century by the founder of Bengaluru, Kempe Gowda I. Gavipuram Cave Temple is dedicated to Lord Shiva and witnesses Hindu devotees in thousands of numbers every day, who visit this architectural masterpiece to pray and pay offerings to God. This temple is extremely popular for its architectural beauty as the Nandi placed in the court of the temple helps in brightening the shrine of the temple, as the sunrays pass between the horns of Nandi at a certain point in time in the year. It has been made with such perfection that you can witness the mystic and mysterious beauty of this temple every year, in its historical court, on the day of Makar Sankranti. Badami cave temples are immensely popular amongst tourists who come in millions every year to discover their veiled beauty. Located in the Badami town of Karnataka, this ancient complex has cave temples dedicated to Hinduism, Buddhism and Jainism, thereby, making the site an ideal instance of secularity in Karnataka. From rock-cut temples to the architectures of Chalukya dynasty, you can explore a lot of sites and unravel the mystery behind their peculiarity. How about getting to the historical town of Badami and revealing the hidden charm and incredible beauty of these cave temples? 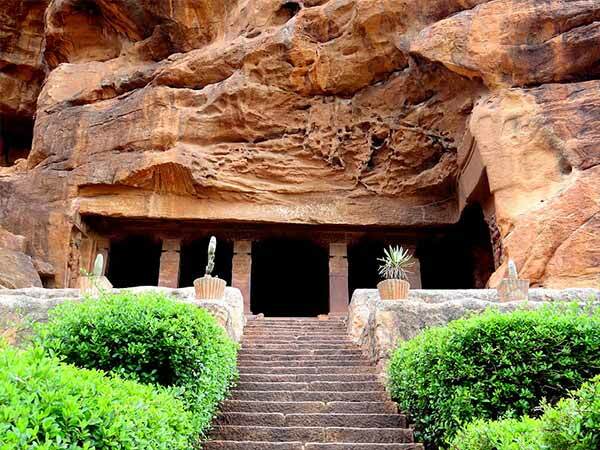 Being an archaeological site situated in the Bagalkot district of Karnataka, it is expected that this historical place possesses few ancient temples settled peacefully inside the caves. Most of monuments and sculptures found here date back to the period of the 12th century and hence, it has become significant to explore the history of the town and the state. There are several cave temples dotted all over the Malaprabha Valley. Even though many of the temples here cannot be found in their original form, it is still a major attraction for history lovers. If you are definitely one amongst the explorers of Indian history, then Aihole is your destination. Nellitheertha region of Karnataka and dates back to the era of the 15th century. Even though it is not popular amongst tourists, resulting in the ignorance of its significance and beauty, it is still a spot for Hindu devotees who idolise Lord Shiva and are seen exploring the Shivalinga. Outside the cave, too, there is a temple dedicated to Lord Shiva in the form of his statue. If you are looking to be inside this age-old cave, then be patient and a little bit passionate about it as you will need to bend down on your knees and crawl to get inside the cave.